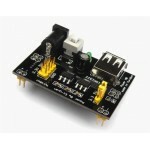 Buy online 1117-3.3V Power Supply Module in India at low price from DNA Technology, Nashik. This is a simple low cost breakout board for 1117-3.3V voltage regulator module. Input: DC 4.5 V - 7 V (input voltage must high than output voltage 1 V above). Double panel design, layout beautiful and easy. Special design two row needles fixed hole, can be directly fixed on the hole plate for extended experiment. Input/output use 2 p single row needle , convenient connection.